Turns out that worms are not only be helpful in the garden, in a kitchen composter, and (as recently promoted by Bill Gates) in a stand-alone toilet unconnected to a water supply. But who would have ever thought of using them as a mosquito repellent? Yet another argument for maintaining diversity. We simply can’t imagine the many ways in which insects, weeds, and other undervalued life may benefit humanity . An image, from a scanning electron micrograph, of Heterorhabditis megidis nematode worms (colored blue). These parasitic worms harbor a bacteria that repels mosquitoes. Susan Paskewitz, a professor of entomology at the University of Wisconsin-Madison who oversaw the study, explains that the project started in the lab of her late colleague, Que Lan. She and her student Il-Hwan Kim were studying bacteria called Xenorhabdus budapestensis, which lives inside the tiny roundworms called nematodes. These nematodes parasitize insects in the soil, sneaking into their bodies and releasing hordes of Xenorhabdus, which soon kill the insect. Then, without the insect’s immune system to contend with, the nematodes devour the carcass and multiply. According to Paskewitz, Lan wanted to crack Xenorhabdus’insecticidal code in hopes that it might lead to a novel mosquito killer. She put the bacteria into the artificial blood supply she feeds to her mosquito colonies, hoping they would ingest the bacteria and she could track whether the mosquitoes were harmed. But her mosquitoes wouldn’t go anywhere near the treated blood, much less ingest it. “The mosquitoes would die from drying out rather than touch the thing,” says Paskewitz. That observation stuck in Paskewitz’s mind, suggesting that something produced by these bacteria make might be useful as an insect repellent. Since the 1940s, the chemical DEET has been our first line of defense against mosquitoes. 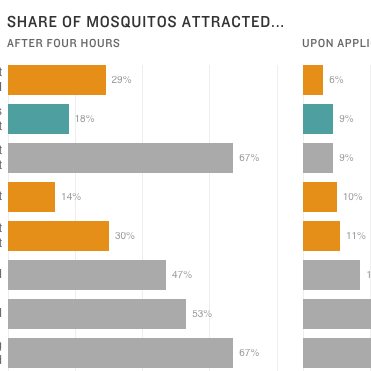 It’s still the most effective repellent we have.But DEET has its problems. One is stigma. “As a public health entomologist, I believe that DEET is an effective and safe product to use [the EPA agrees], but I do know that some consumers are concerned about synthetic chemicals,” says Paskewitz. “Whether those concerns are founded in evidence may be beside the point. What matters from my perspective is that people don’t have a barrier to using repellents, so that in the event of the next Zika or West Nile virus outbreak, we’re prepared.”DEET also needs to be reapplied often, which can leave people exposed if they forget. And at high concentrations, DEET can melt plastic, making it difficult to imbue DEET into clothing that could be worn for longer-lasting protection. What’s more, DEET’s effectiveness may not be permanent, according to Silvie Huijben, an evolutionary biologist and disease ecologist at Arizona State University. “There is some evidence that resistance to DEET can evolve in mosquito populations, and mosquitoes can also learn to overcome their aversion to DEET,” she says. Because living populations can evolve in response to single interventions, it’s best tackle the problem from many angles. “In that sense, there is a void to be filled,” Huijben says. Kajla explains that since we don’t yet know whether this substance is toxic, scientists can’t just slather a subject’s arm in Xenorhabdus, stick it into a swarm of mosquitoes and see if they bite. So instead, he put a mixture of mosquito food – basically, fake blood dyed red — inside a skin-like sausage casing membrane. He soaked cheesecloth in the bacterial soup and layered it over this casing. Then, mosquitoes had 30 minutes to feed, after which the researchers counted how many mosquitoes were engorged with red bellies. The better the repellent, the fewer red bellies. “We were surprised at how well the bacterial repellent worked,” says Kajla. You’d need three times as much DEET and eight times as much picaridin, another effective repellent, to repel the same percentage of insects. “This is a really exciting result,” says Matthew DeGennaro, a neurogeneticist at Florida International University who studies mosquito genetics and was not involved in the study. 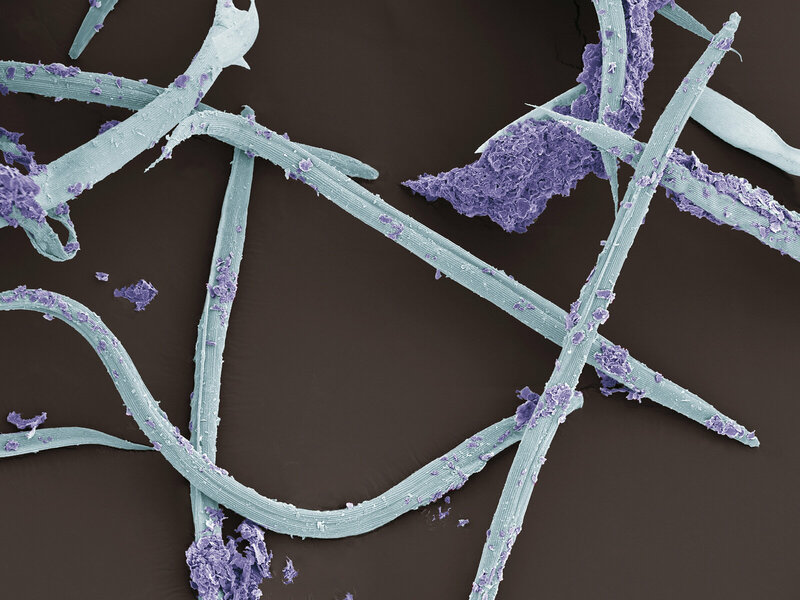 “DEET is almost like magic, and we don’t find things that work as well as it does everyday.” DeGennaro also raised the possibility that the mosquitoes’ repulsion might be an innate, adaptive strategy to avoid getting anywhere near the deadly Xenorhabdus that harbor the compound. More work needs to be done before you can douse yourself in this bacterial concoction and head into the woods with abandon. According to Paskewitz, fabclavines may be difficult to chemically synthesize at scale. But “bacterial fermentation, which is used to produce the widely used insecticide Bt could work for fabclavines,” Paskewitz says. According to Huijben, the broader fight against mosquito-borne disease is changing, and repellents may play an increasingly important role. In the case of malaria, which she studies, mosquito populations are adapting around once effective measures. Bed nets proved effective in preventing the transmission of malaria via mosquitoes, which historically happened during evening hours when mosquitoes fed. But Huijben says mosquitoes are evolving to feed outside during the daytime, when their food source isn’t safely snoozing under a net.